Ever wonder what you are going to do with all of those tomatoes growing in your garden? Why not make some awesome homemade ketchup that tastes just like the name brand. It seems like every year I end up with all of these volunteer tomato plants. And, of course, most of them end up being the less desirable cherry tomatoes! So this year I have ended up with literally thousands of cherry tomatoes that are started to drop and just go to waste. 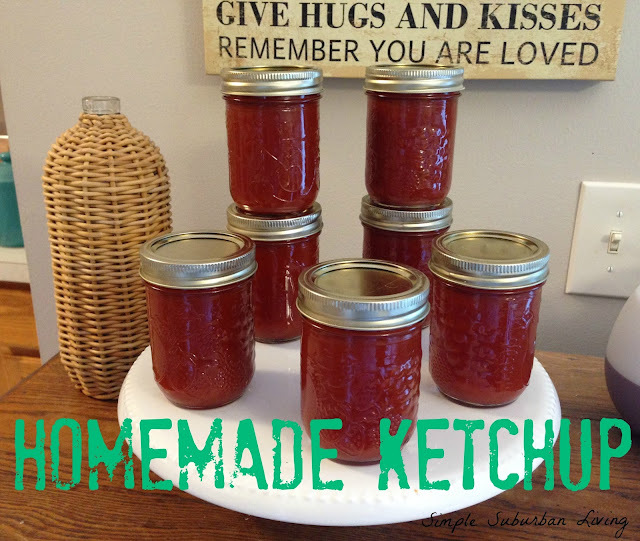 I decided to start collecting them all and found a great recipe for homemade ketchup. We tried this recipe a few weeks prior and absolutely loved it and thought we would share the process with you. Below is the recipe and directions for making homemade ketchup using any variety of tomatoes you have on hand. One thing to remember is that one batch of this recipe only make about 1 half pint of ketchup so if you want to make a lot for long term storage you will need a lot of tomatoes! 1. Cut tomatoes in halves or quarters and scoop out as many of the seeds as possible then add to blender or food processor. process until you have enough for one batch or about 56 ounces (4-5 cups once processed. 3. Cook on med-high heat to cook off excess water. Cook it until it is about half of original volume. 5. Once it is cooked down ladle into fine metal strainer and force through scraping off the ketchup from the bottom of the strainer as you go into bowl. 6. If ketchup is still watery cook down further until desired consistency. 7. You may can this ketchup for long term storage or if done in smaller batches can be kept in ketchup bottle or canning jar in the refrigerator for a few weeks.